Logan originally found fame on Vine – Twitter’s short-form video platform – back in 2013. Back then, he used to wear his hair much shorter. Here he is pictured at the 2014 Billboard awards for example. At only around 20 years of age, Logan had already gained millions of followers on Vine. And when Vine was discontinued, he successfully switched over to YouTube where his fanbase continued to grow. But another big change during this time was Logan’s hairstyle. Gone was the short, slicked back look of before. Logan grew his hair out and began combing it forward in this weird, 70’s style bouffant. The blondeness, the many partings, the general weirdness of it: it kind of reminds me of another famously unfashionable hairstyle. It just doesn’t look like the sort of hairstyle someone would freely choose. Instead, it looks like a hairstyle selected out of necessity. Look at where Logan’s hair is parted from. Hair from the sides is brushed upwards to make it look like there’s more up top. There’s only one name for this sort of hairdo: a combover. It’s ironic that around this time Logan Paul starred in a film called The Thinning. I don’t know what the film is about but with a title like that I can only assume it’s about a young man’s battle with baldness. If so, it makes sense that YouTube would select Logan to be the leading man. During his many misadventures – which have included filming a dead body in a forest, tasering a dead rat and disrespecting an entire country – Logan has been keen to hide his hair line under hats or with his signature combover. At around 6:12 of the video, Logan runs into the crowds. The wind lifts his Trump-style combover and reveals the horrifying truth. 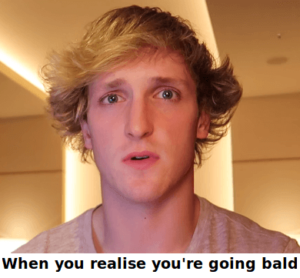 Yes, Logan Paul is going bald. He’s inherited his Dad’s hair loss genetics and is destined to go bald just like his father. I can just picture the tears of young girls across the country as they realise their crush isn’t the guy they thought he was. I can hear the rattle of trash cans as millions of 9 year old boys throw out their Maverick merchandise in disgust. Sponsors will be backing out of deals now they realise Logan is no longer the cool, young, good-looking ambassador he once was. 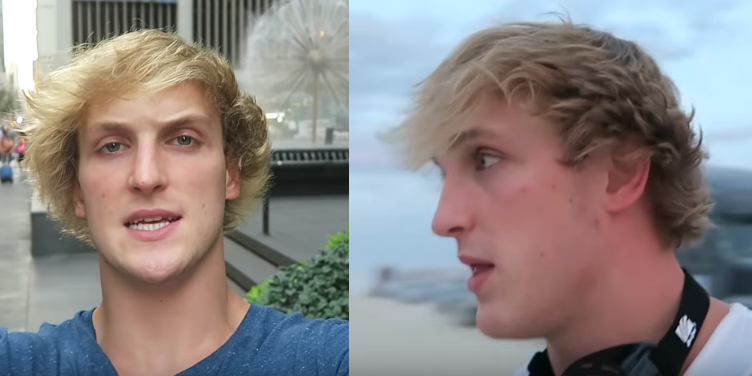 I hear YouTube is planning a sequel to The Thinning and they want Logan to play the lead role. It’s called The Completely Bald. Next post: Has JORDAN PETERSON had a Hair Transplant? Why are you so mean to him? Do you really think that a rising hairline (or balding) will destroy his career? It’s not so big deal. His entire image is his looks. He’s a big douche and glad he’s balding. Say goodbye to your career douche! He’s rich he can take medicine or get plastic surgery if he wanted to.